In this month’s box you’ll among other tasty goodies find the luxurious ”Black forest gateau” chocolate with cherries. 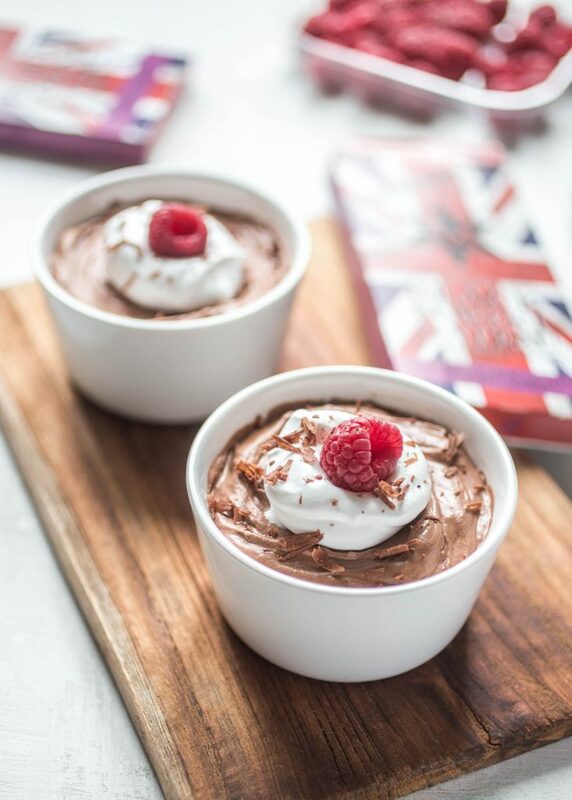 The chocolate is delicious on its own, but it’s also superb in desserts – like this vegan chocolate mousse! The mousse is creamy, fluffy and rich, in other words perfect to the festive holidays! If you would like to make this dessert, it’s still not too late to order your Vegobox – tomorrow we ship the last boxes so that they will arrive before Christmas. Add the coupon XMAS15 in the checkout to get 15% off your order today! Chop the dark chocolate finely and place in a bowl (if you like you can grate a little bit of the chocolate to use as garnish for later). Bring 1 cup of the cream to a boil and pour over the chocolate. Leave for a minute and then stir until the chocolate melts. Add cocoa and sugar and place in the fridge to cool completely. Whip with an electric beater to a fluffy mousse, add the raspberries (to taste) and then spoon it out in three bowls or glasses. Whip the remaining cream and top it over the mousse. Garnish with raspberries and grated chocolate and serve.